We begin with this champagne flute valentine, which sends a festive message of love. Step 1: Select your champagne flute. I used a teal plastic flute that was left over from this New Year’s Eve party photo shoot. If you’re making a group of these special valentines, consider purchasing a pack of plastic champagne glasses from your local party store. 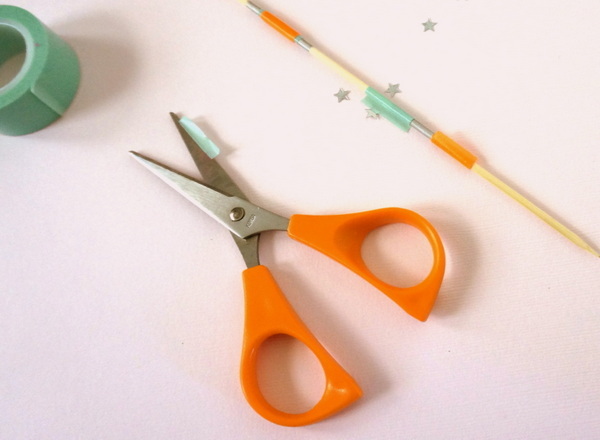 If you’re crafting only one or two, it may be cheaper to buy individual glass flutes. Step 2: Fill the glass with metallic shred. I always have a pack of metallic shred on hand. It’s an instant way to add glitz to a festive centerpiece or jazz up your party table. 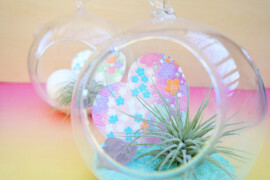 You may also decide to fill the glass with edible treats rather than metallic strips! 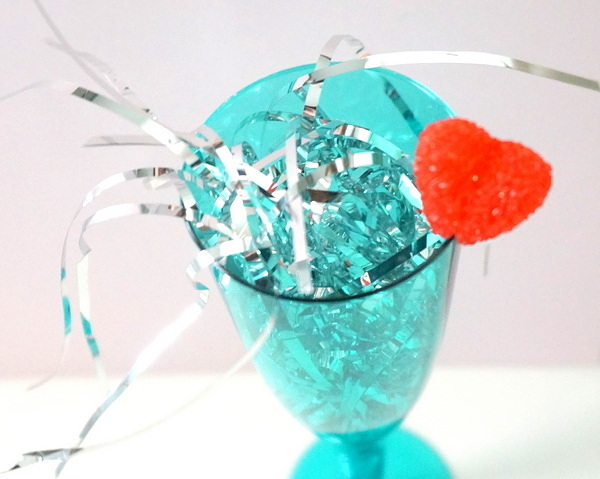 Step 3: Garnish the glass with a gummy heart candy. 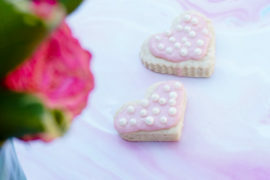 This special touch gives your valentine a sweet treat to enjoy. EASY SHORTCUT: If a trip to the craft store isn’t in the cards today, don’t worry. You can throw this valentine together in no time! 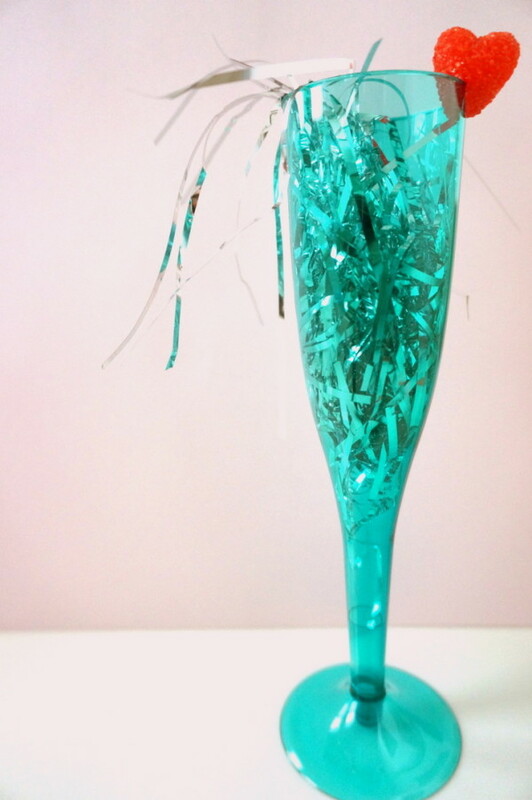 Fill your champagne flute with any festive material you have on hand, such as curled gift ribbon. No candy? “Garnish” your glass with a paper heart. If your Valentine happens to live in your home, you can use a glass champagne flute from your pantry–you know it will be returned! 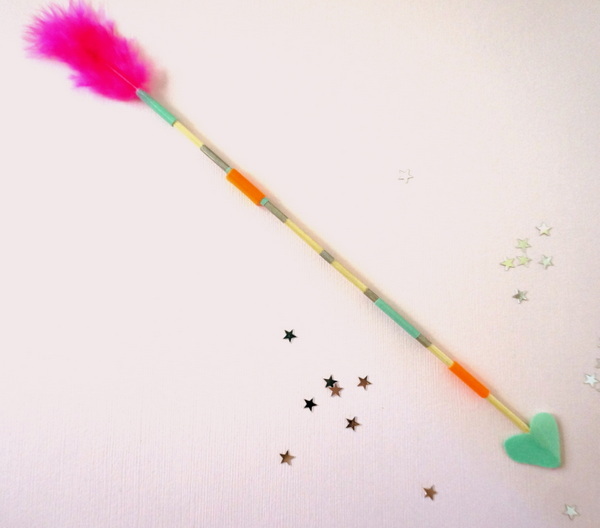 I’ve been so inspired by all of the DIY valentine arrows that have hit the blogosphere this year! 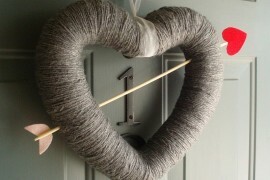 I’ve adapted my Valentine’s Day arrow project (shown below) from this amazing DIY via Curbly. 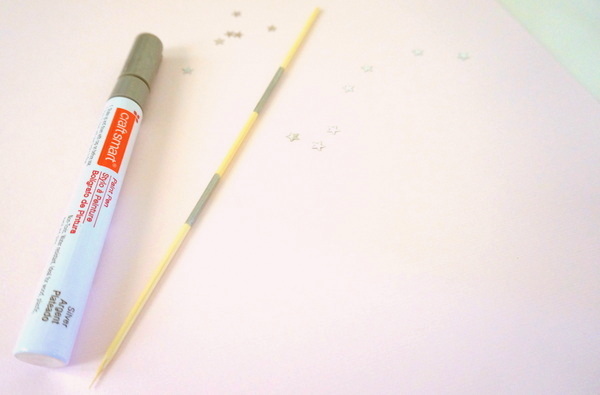 Step 1: Use a paint pen to decorate sections of your skewer. For a special touch, use more than one paint pen/color. 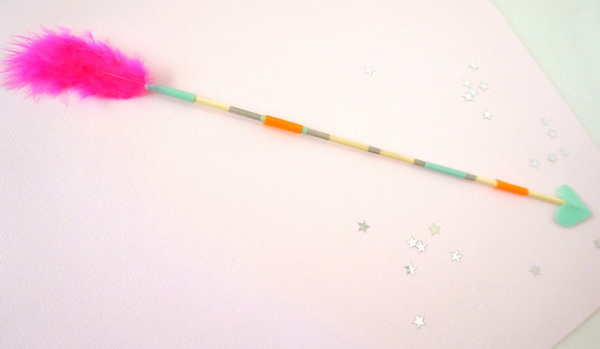 Step 2: Use washi tape to attach your feather to one end of the skewer. If your feather doesn’t have a prominent quill, cut away some of the feathery bulk near the bottom. 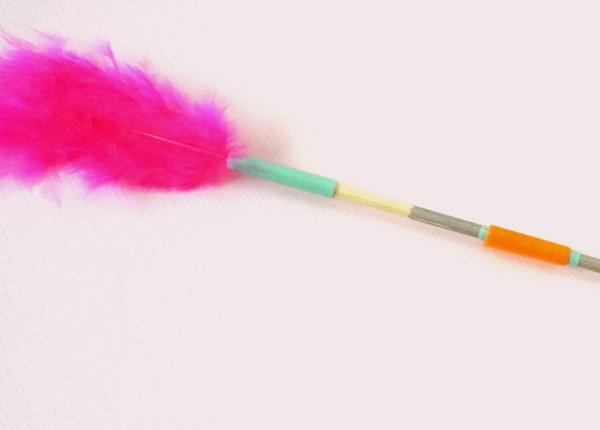 A clean quill is much easier to wrap/attach to the skewer than a fuzzy one. 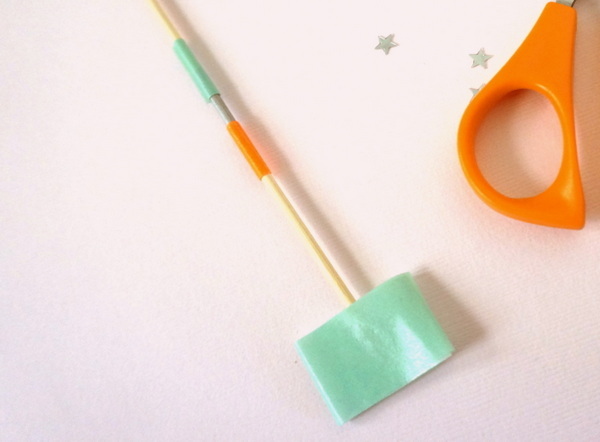 Step 3: Wrap the washi tape around the skewer in colorful sections. If you have more than one roll of tape, and the rolls are different widths, you can even layer the tape. 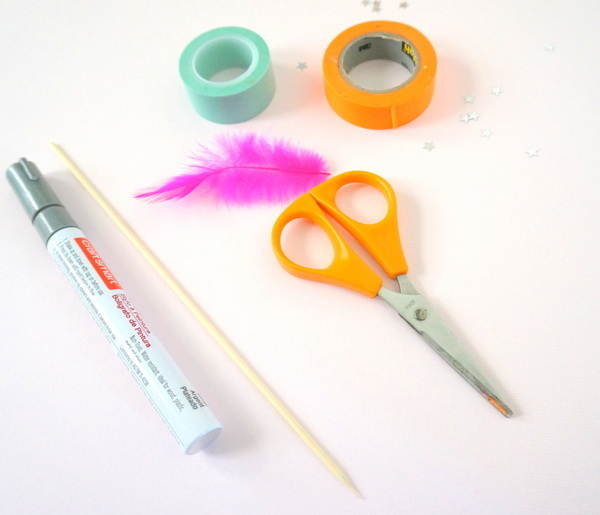 A helpful hint: use a dab of glue or a swipe of the glue stick to help secure the end of each piece of tape–washi tape likes to unravel itself! 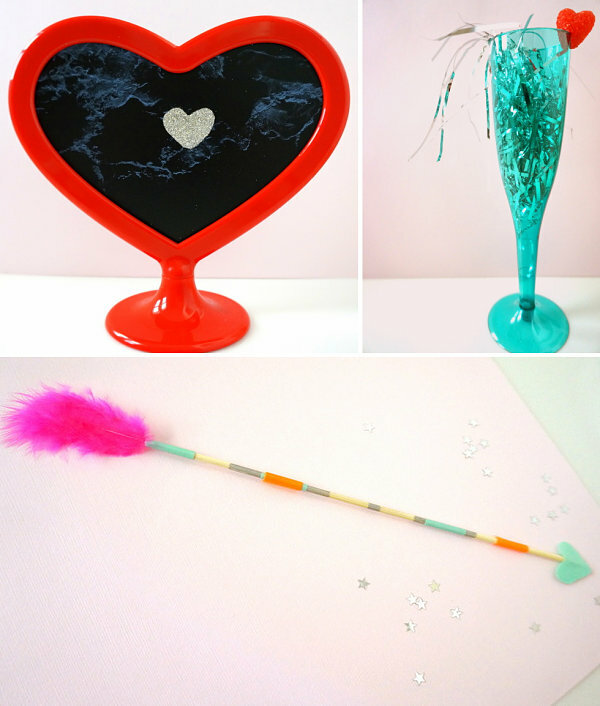 I’ve made several of these Valentine’s Day arrows to give as gifts this year, and the recipients loved their colorful mementos! Skewers are smaller than dowels (which are often used for this project), and the result is a mini-arrow that makes a big statement. Our final featured DIY project celebrates the current marble revival. The look is fun, sleek…and a little bit ’80s! Step 1: Remove the glass, plastic or paper insert from the frame of your choice. 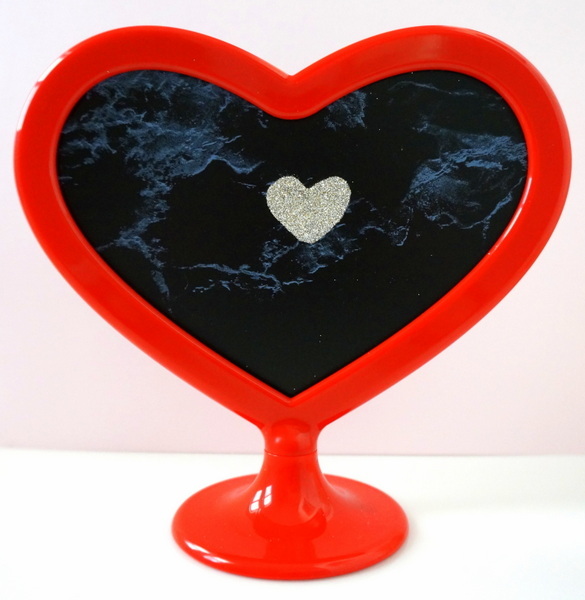 Use it as a stencil to trace and cut out the shape–likely a heart–onto your marble-patterned paper. Any marble-patterned paper will do. 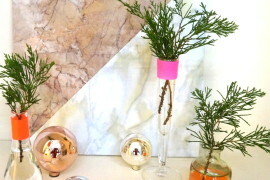 I had some leftover contact paper from another DIY project, and it did the trick! The frame is from IKEA. 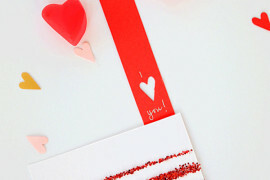 Step 2: Paint or dab a heart design of glue onto the paper. 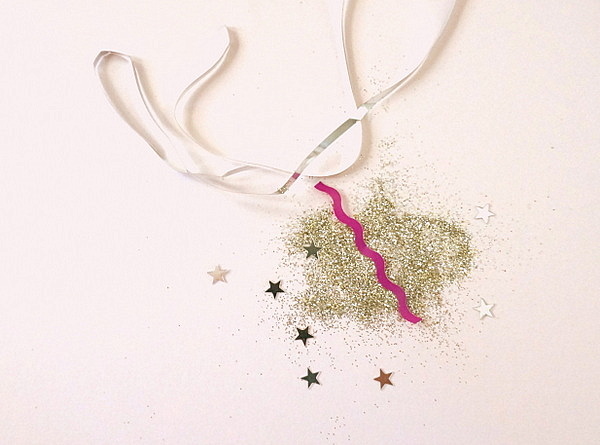 Sprinkle with glitter, then shake off the excess sparkles. I used ultra-fine glitter for a more defined look. Step 3: Wait for the glue to dry, then insert your valentine back into the frame. 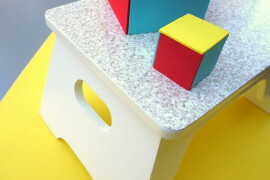 If the glue isn’t dry, the design will become smudged. 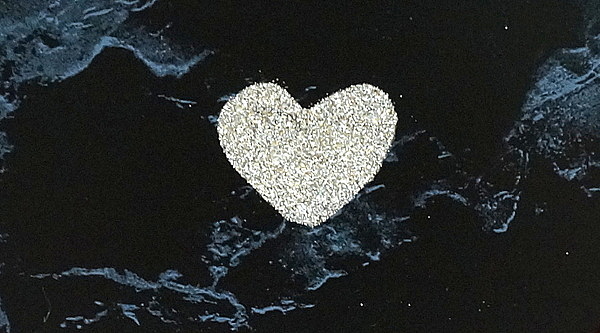 EASY SHORTCUT: Use a piece of construction paper and embellish it with a glitter heart. Framing is optional. This project is not about the exact supplies. It’s about creating a glittering focal point that catches the eye! 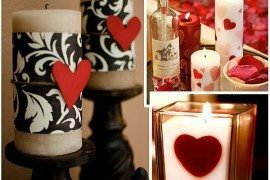 We at Decoist wish you the Happiest of Valentine’s Days. Let the people you care about know they are cherished. 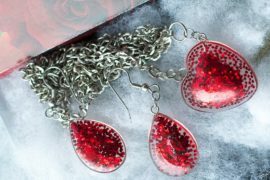 And whether you have romance in your life at this time or not, do something nice for yourself. There’s no rule saying that one of these valentines can’t be for you!